Guess Who’s Instagram’s Newest Weave Model? If you’re a user of Instagram, you’ll come across companies using everyday people to model or promote their products. Especially in the area of beauty and fashion. From makeup to diet teas and boutique fashions, Instagram can be a cesspool of cheap clothing, health nightmares and weaves. One weave company seems to have found its perfect spokesperson when it comes to highlighting ethnic—or, as it calls it, “boho exotic curl”—hair. Of course, that person is none other than Rachel Dolezal. Yes, the former NAACP-chapter leader who was passing as black until her lily-white parents outed her. And, needless to say, not everyone is pleased with Dolezal’s modeling weave. “This is disgusting. You profit off of black women, then you have Rachel Dolezal promote your hair? Do you not know how problematic and destructive she is. Your [sic] disgusting,” one commenter wrote. 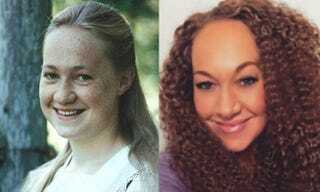 It also looks as though Dolezal is still holding on to her bronzer, or whatever dark makeup she uses to get rid of her naturally pale skin, even though she did finally admit on The Real that she is indeed white. Of course, Dolezal will always have her fans. Those who appreciate the work she’s done in the black community. Those fans are hilarious, though. Oh, before I forget, just so you don’t have to waste time, “Blah blah blah, black women wear weave, too.” Yeah, we haven’t heard that one 1,000 times before.